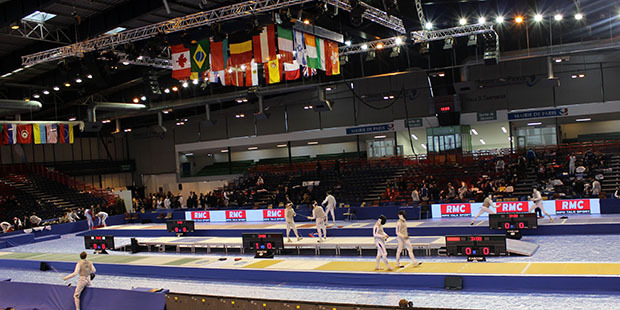 KABCOM is a leading organiser of competitive fencing events worldwide. Since 1992 they have organised several Olympic Games, many regional competitions such as the Asian, African and Pan-American Games, and a number of World Championships. In addition, they arrange both the Fencing Grand Prix and World Cups annually. 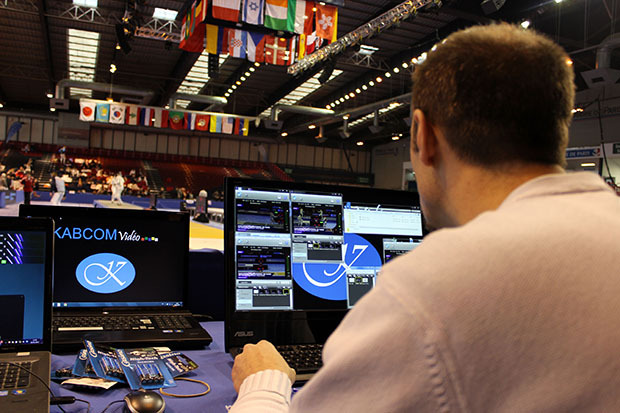 Depending on the scope of their event, the company offers customers a variety of services including everything from scoreboards to fencing tracks and signaling, software for data processing, TV Graphics, and video arbitrage systems developed to allow referees to watch replays and make decisions based on the video recordings. Lately, live production video streaming has become an important part of their offering, allowing fans everywhere to see the action. At KABCOM we pride ourselves on providing cost-effective new solutions using the latest technology and as some of our technicians are themselves former fencers, they play a key role in identifying the needs upon which we base new ideas, explains Noureddine Kaabi, director of the sports department at KABCOM. Unlike in other sports, fencing takes place on four tracks simultaneously, so there are four matches going on at the same time. We needed a streaming solution that would allow us to capture all four videos and stream them using a single unit. We realised that Matrox was developing the VS4 and knew it was exactly the hardware required. Matrox VS4 is a quad HD capture and ISO recording card for Telestream Wirecast for Windows live production streaming software. In a single PCIe slot, Matrox VS4 provides up to four independent HD inputs with up to 8 embedded audio channels per source. It not only sends video feeds to Wirecast for streaming, it simultaneously provides ISO recording of all the original video and audio feeds to disk ready for post-event editing. Given our considerable experience in this field, we always aim to offer our customers a comprehensive, reliable and flawless solution. The Matrox/Telestream system lets us open multiple instances of Wirecast and assign specific VS4 video inputs to each instance of the software, giving us the flexibility to stream individual matches to specific internet channels. Internet viewers can choose to watch one particular match or all four at the same time. Before using the Matrox VS4, we did not have a solution to this problem. We have used other capturing devices in the past, but the results were just not up to our standards. The Matrox VS4 was the only product that met our requirements. The SDI capture is excellent and we can run cables up to 300 metres in SD and 100 metres in HD, a necessity in some venues. We are now able to offer multiview streaming with several cameras simultaneously filming a competition final. This way, the video appears very much like a TV production. We are convinced that this VS4/Wirecast solution would be very useful in other sports too such as judo or athletics. However, the internet speed does of course have to be sufficient to accommodate four simultaneous streams. We have also developed a system for commentators allowing them to switch between pistes in order to comment on only one piste at a time. This way viewer can for example watch the A piste streaming without being interrupted by commentary regarding piste B. After the success of our new system this season, we now have an overbooked calendar for the next one!" Implemented at the start of the fencing season, the VS/Wirecast solution has been used for many events to date. The International Challenge of Paris in January 2013 attracted 67,424 online viewers. Another important event streamed lived was the World Championships in Budapest in August. KABCOM sometimes covers two fencing competitions concurrently so they maintain two streaming systems, both rack-mounted. Customer satisfaction is a key factor in our business, but flexibility and the ability to work in good conditions are also very important. The setup timeframe prior to a fencing competition is tight so we generally have to install 4500 kg of equipment in a single day. The streaming system is just a small part of all that gear, but we need it be reliable, and easy to get up and running. As far as were concerned the Matrox VS4 system is THE product for our live streaming production needs.